Blackcap basslet larvae (Gramma melacara) were raised from captive-spawned eggs at 77-79F on rotifers and artemia. The larval duration was 25 days. 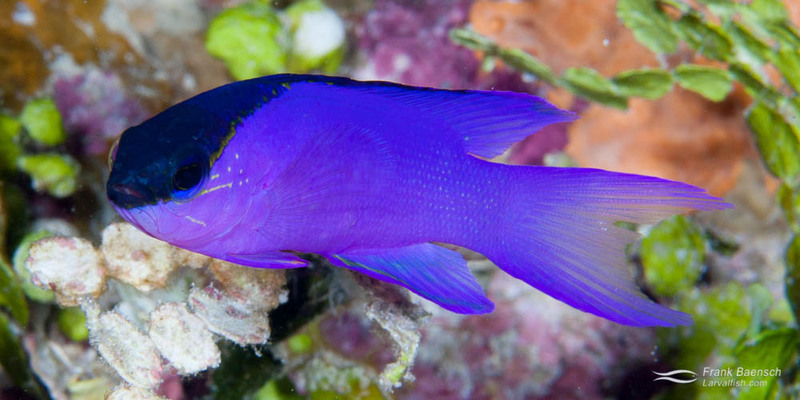 The Gramma genus comprises only four species (the royal gramma, the blackcap basslet, the yellowlined basslet and Gramma dejongi), all of which inhabit the Caribbean region. The royal gramma and blackcap basslet are quite common in the aquarium trade, the former being the most popular. Fairy basslets are hardy and docile aquarium residents but should be properly paired if kept together with members of their own kind. They thrive on most conventional aquarium foods and can be kept in smaller tanks but need lots of good hiding places. The fairy basslets have been cultured by a number of farms but production has not been consistent over the years. They were first raised as far back as the 1960’s. The Blackcap Basslet (Gramma melacara) is the deepwater cousin of the more common fairy basslet. It prefers only moderate lighting and, being sub-tropical, water temperatures between 76 and 80º F. This species is difficult to pair because of its extreme aggression towards members of its own kind and lack of sexual distinction. Males are usually larger and slight more elongated than females in the wild. All fairy basslets are demersal spawners. In the wild males build nests out of macroalgae in carefully selected crevices. At my facility they spawned in pieces of PVC pipe closed on both ends with a small entry hole drilled in the middle. Nests were built out of shredded filter material at the beginning of the spawning season (winter). Spawning took place in the afternoon, every day or two, over several months. Females can produce anywhere from 10 to 100 eggs with each spawn. G. melacara eggs are slightly larger than 1 mm in diameter and hatch after 6 days in the sequence they were laid. Newly hatched G. melacara larvae feed on s-type rotifers within 14 hours. G. melacara larvae are relatively easy to raise on enriched rotifers and artemia and metamorphose between day 24 and 33 in Tetraselmis greenwater. G. melacara metamorphose noticeable earlier when fed Tetraselmis enriched Artemia that was further enriched with Shizochitrium than with Tetraselmis enriched Artemia alone.